Mals, Italy, has long been known as the breadbasket of the Tyrol. But recently the tiny town became known for something else entirely. 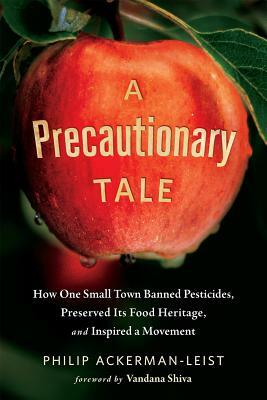 A Precautionary Tale tells us why, introducing readers to an unlikely group of activists and a forward-thinking mayor who came together to ban pesticides in Mals by a referendum vote--making it the first place on Earth to accomplish such a feat, and a model for other towns and regions to follow. For hundreds of years, the people of Mals had cherished their traditional foodways and kept their local agriculture organic. Their town had become a mecca for tourists drawn by the alpine landscape, the rural and historic character of the villages, and the fine breads, wines, cheeses, herbs, vegetables, and the other traditional foods they produced. Yet Mals is located high up in the eastern Alps, and the valley below was being steadily overtaken by big apple producers, heavily dependent on pesticides. As Big Apple crept further and further up the region's mountainsides, their toxic spray drifted with the valley's ever-present winds and began to fall on the farms and fields of Mals--threatening their organic certifications, as well as their health and that of their livestock. The advancing threats gradually motivated a diverse cast of characters to take action--each in their own unique way, and then in concert in an iconic display of direct democracy in action. As Ackerman-Leist recounts their uprising, we meet an organic dairy farmer who decides to speak up when his hay is poisoned by drift; a pediatrician who engaged other medical professionals to protect the soil, water, and air that the health of her patients depends upon; a hairdresser whose salon conversations mobilized the town's women in an extraordinarily conceived campaign; and others who together orchestrated one of the rare revolutionary successes of our time and inspired a movement now snaking its way through Europe and the United States. An insert with images by multimedia artist Douglas Gayeton brings the town, the land, and the people to life; and a foreword by Vandana Shiva calls upon others to follow in Mals's footsteps.